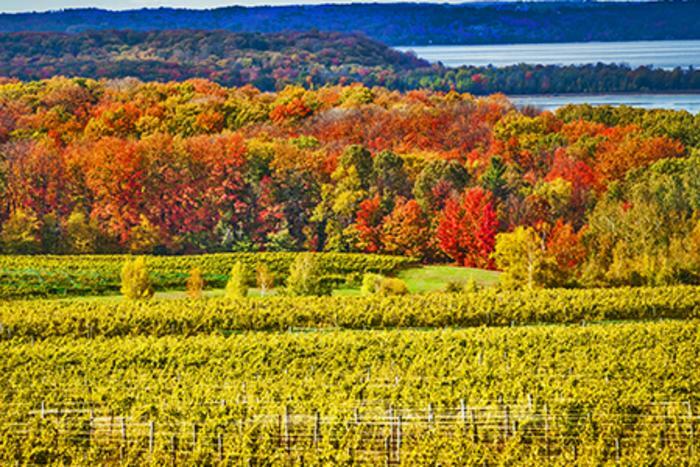 TRAVERSE CITY, MI – Two truths: Traverse City is pretty (great) in the fall, and saving a couple bucks is pretty smart. This season Traverse City Tourism combines its beauty and brains in another round of Fab Fall specials. From September 4 through December 14, visitors can rake in discounts at participating resorts and hotels, plus score exclusive savings on shopping, dining, spa services and entertainment. If you’re into wine tasting, come check out 40+ wineries in their annual harvest. It’s the same time of year our hops are plucked and used at a dozen local breweries, and our craft distilleries, well, they’re still stilling this fall, too. Whatever your libation, be sure to balance with our drool-worthy food scene, rated among the country’s top five food towns by Bon Appetit. Fab Fall lodging must be directly booked through participating hotels available now at fabfall.com. Upon check in, you’ll receive coupon books and information on how to spend your time in all the best places of the season. Discounts? Vacation? Pretty fall colors? Yes, friend. Welcome to Traverse City, a pretty great place. Jenny Jenness is the Public Relations/Media Manager at Traverse City Tourism. She came to the company after a four-year stunt on local television talking up all things feel-good in northern Michigan (there's a lot of content there, guys). Jenny and her husband live in downtown Traverse City and enjoy long romantic walks into microbreweries. And beaches. Those are pretty nice here, too.